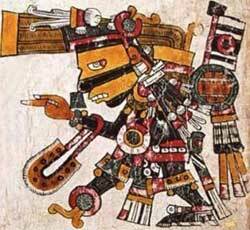 Tezcatlipoca (“smoking mirror”) represents conflict and change in Aztec mythology. As his name suggests, he is often portrayed with a smoking obsidian mirror at the back of his head and with another replacing one of his feet. Tezcatlipoca is the offspring of the creator couple, who produced four sons: Red Tezcatlipoca, Black Tezcatlipoca, Qeutzalcoatl, and Huitzilopochtli (the patron god of the Aztecs). It is the black Tezcatlipoca that most Aztec myths refer to. He is sometimes the adversary of the god Quetzalcoatl and sometimes the ally. During the first world, the sun of earth, Tezcatlipoca ruled over a race of powerful giants who could pull up trees with their bare hands. Quetzalcoatl, however, struck Tezcatlipoca into the sea. When he arose from the sea, he transformed into a jaguar (seen today as Ursa Major) and the race of giants was devoured by a horde of jaguars. The next creation, the sun of wind, was ruled by Quetzalcoatl. Tezcatlipoca, destroys this creation by kicking Quetzalcoatl down, and the result is that fierce winds carry him off with his people. Tlaloc rules over the third creation, the sun of rain, but this is destroyed by Quetzalcoatl in a rain of fire. Finally, the fourth creation, the sun of water, is ruled by Tlaloc’s wife, Chalchiuhtlicue. This world is destroyed by a great flood, the people are transformed into fishes, the mountains are washed away, and the heavens crash down upon the earth. According to the Leyenda de los soles, Tata and his wife, Nene, survive the flood by hiding in a hollow tree and Tezcatlipoca cares for them. He tells the couple to only eat one ear of maize apiece, and as they do so, the waters gradually recede. Once the waters recede far enough for them to come out of their tree, they catch sight of a fish, and tempted, they capture and cook it. When the star gods notice the smoke, they ask who has created a fire. Tezcatlipoca immediately descends, and reprimands them by cutting of their heads and placing them on their buttocks, thus creating the first dogs. Tezcatlipoca and Quetzalcoatl then work together to restore creation by transforming themselves into two enormous trees. Tonacatecuhtli rewards them by making them lords of the heavens and stars.